This thrilling collection features both standalone tales and familiar worlds and characters, including Joe Abercrombie's Red Country backdrop; Jim Butcher's world of Harry Dresden; Lev Grossman's Magicians; Diana Gabaldon's Outlander series; and a story by Caroline Spector in the Wild Cards shared universe. Return to Westoros in The Princess and the Queen, a new novella from George R. R. Martin about the Dance of Dragons, a bitter civil war that divided the kingdom nearly two centuries before the events of A Game of Thrones. It's seldom that a collection of short stories and novellas of such a vast array of authors pulls a listener time after time into its narrative worlds. While I bought the book because of George R.R. Martin's Song of Ice and Fire Novella, I was pleasantly surprised by the 20 other stories. Though not sticking to only fantasy and SciFi the various authors are seasoned and upcoming writers who have staked their claim in the SciFi/Fantasy world. 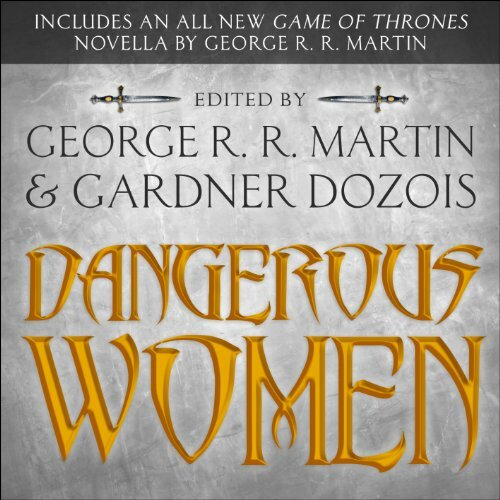 My favourite stories in this anthology are: Joe Abercrombie's “Some Desperado” (when chasing a 'cow girl' the danger is immanent), Megan Lindholm's “Neighbors” (danger lurks in the woman with Altzheimers), Sharon Key Penman's “A Queen in Exile” (when a queen refuses to be just a queen), Diana Gabaldon's "Virgins" (a feline take on Jamie Fraser) and George R.R. Martin's "the Blacks and the Greens" (a war prequel to the Game of Thrones). However there are many more that is probably just as good. This anthology is like a full box of chocolates, the novellas and short stories might not all be to your taste... but they are delicious and worthwhile to listen too. I don't think that you can go wrong. In "Dangerous Women" the adjective 'dangerous' is explored in depth. Almost every time you are challenged by the idea of what could be dangerous in a woman. I really enjoyed it. It is one of a very few anthologies where you cannot go wrong. It is especially worth your while if you are seeking for new authors to listen too. It comes highly recommended!